Annual Intention: This year we reinvigorate Connect DC’s original working to energetically reconnect the District of Columbia’s boundary stones. This work will strengthen our city and community as a vibrant container of healing, hope, and transformation through magick, mystery, celebration, and joy. On May Day 2016, we introduced Two Rivers Sanctuary as the home of Connect DC, Reflections Mystery School, and the Order of Elemental Mysteries (OEM). Although OEM has been incorporated as a church in Washington DC since 2012, we felt we needed to draw attention to the reality of pagan-owned land in our nation’s capital. We have organized and led public rituals, classes, and programs for almost two decades. 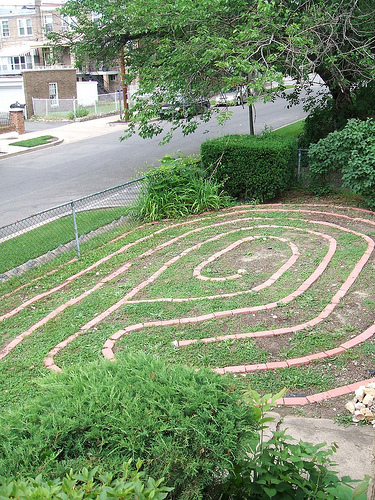 For the last several years our temple and labyrinth have provided dedicated sacred space for use during these rituals and classes. We have dreams of expanding our membership and our mission. Pagans, spiritual seekers, and all who are curious about engaging with Mystery are invited to join us. Our mission connects individual spiritual work to the diverse communities that surround us and to the work of humanity as a whole. This work is only possible when we can meet our annual expenses and have the energy and resources to grow our work. Our annual fundraising goal is $5000. We are asking for your support during our annual membership campaign. Two Rivers Sanctuary is the home of Connect DC, Reflections Mystery School and the Order of the Elemental Mysteries. It houses our temple, our school, and the motherhouse of our religious order. We hold rituals on the sabbaths of the solar wheel and full moon meditations. Reflections holds it classes within the temple and our labyrinth is open during Full Moons. The entire community is invited to join us on service days as we work together on service projects, cleaning up the temple and caring for the labyrinth and garden. Support our Annual Membership Drive. Our fundraising goal this year is $5,000. In this 3-month course, we explore our earthly allies of Herbs, Trees, Crystals, Candle Magic. This class meets on the second Saturdays of April, May, and June (April 13th, May 11th, and June 8th) from 12:30pm to 5pm.